It’s a New Year! Time to Exercise Your Creativity! As a New Year begins, many people make resolutions — often about eating properly and exercising more. While those are excellent thoughts, I’d like to challenge you (and me) to consider feeding our creative spirits and exercising our creativity more in the new year. Why? For one thing, being creative is FUN! 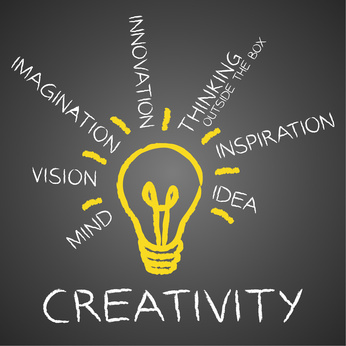 There are also other amazing benefits to including a balanced “creativity diet” in our lives. This article tells that not only does getting involved in creative pursuits like music lessons, or dramatic opportunities expand kids’ imaginations and hone their talents, but it also makes them more empathetic and encourages emotional maturation. They quote James Hudziak of the University of Vermont College of Medicine as saying “the more a child trained on an instrument, it accelerated cortical organization in attention skill, anxiety management and emotional control.” How about that for an unexpected benefit? An article in the Washington Post lists 10 skills that kids gain from training in some aspect of the arts. These include confidence, problem-solving ability, understanding of accountability, and more. How do we incorporate more creative “food” into our diet? How do we exercise our own creativity? Go to a concert. There are all kinds of symphony concerts geared to kids. Check out what’s available in your area. Sign up for individual or group music lessons — or make singing in the car as you drive somewhere a thing your family does. Just open your mouth and SING! Read a book like Susan Verde and Peter H. Reynolds’ The Museum, then go to a local art gallery and explore what’s there. Look for kids’ programs. Get a coloring book (there are gazillions available these days) and have a blast coloring. Read Peter H. Reynolds’ The Dot and Ish, and just draw, paint, — make your mark somehow! What ways can YOU think of to exercise your creativity?